Antonie Mendlik was born on May 24, 1892 in Zalusi about 65 miles south of Prague in what is now the Czech Republic. She was the oldest of nine children of Frantisek Mendlik and Frantiska Bastyr Mendlik. She completed the eighth grade and at age 14 was sent to Prague to work in a household. At the age of 16, her father arranged for her to leave for America with John and Joseph Smetana who were neighbors and very close friends of the family. She arrived in Baltimore in 1908. Antonie and the young men traveled from Baltimore to Cleveland where Bohemian families welcomed them. 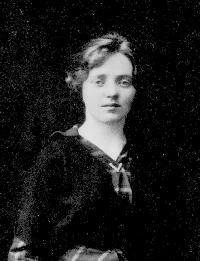 Antonie lived with the Havlice family where she learned English. Shortly after her arrival, she was chosen to be the nanny for the Manak family; an affluent family of Bohemian descent. She cooked and took care of their one son. The Manak's were well educated and encouraging of Antonie as she took formal lessons in English. Mrs. Manak was an educator and Mr. Manak held an office in the Cleveland Trust. The family took an interest in her welfare and gave her advantages such as attending the opera and concerts, learning to cook gourmet food. Antonie was also very talented in needlework. She learned to crochet by making baby items in first grade. In Cleveland, she and a friend seized an opportunity to work for a manufacturer of ready made clothing. She remarked that she and her girlfriend would walk by the shops and take note of the styles and copy them for themselves from memory. Hynek Rybnicek had also immigrated to the US and had grown up within 30 miles of her hometown. They met when they were both members of Cleveland's Bohemian community. After Hynek left Ohio to seek work as a farm laborer, he began to correspond with Antonie. Antonie's father had given Hynek's mother her address. 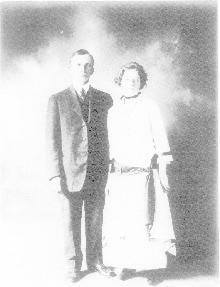 He courted her with $200 borrowed from the bank in late 1914. Hynek always called her "Toni" with a Czech pronunciation. On Junuary 7, 1915 they were married in the Bohemian National Church, Our Lady of Lourdes (which is now on the National Registry of Historic Places). Almost immediately they left by train for North Dakota. Soon after their arrival in Mandan, the couple traveled out to Hynek's homestead 5 miles south of Mandan. Rybnicek had filed for the homestead shortly after he arrived in North Dakota in 1909. Antonie admitted how frightened she was when she first saw the "shack," especially when the horse took off with Hynek chasing after it on foot. But by this time, the contract was satisfied and they did not have to live on the claim. The couple lived initially near Hynek's job at <?xml:namespace prefix = st1 ns = "urn:schemas-microsoft-com:office:smarttags" />Bismarck Marble and Granite Works (now Bismarck Memorial Company). Despite financial hardships, Antonie quickly encouraged her husband to set up his own business. Hynek opened up Mandan Monument Works at 522 W Main St. in July 1915 and the couple moved to Mandan. With two years, they saved enough to buy their own home. Their house located at 710 Fifth Ave NW was located seven blocks north of his business and within a Mandan neighborhood frequently referred to as "Happy Hollow." Antonie and Hynek were parents to two children, a son Ervin Hynek was born in October 1917 and a daughter Libuse born in June 1926. Their home also hosted Antonie's brother Stepan while he worked for Hynek. In December 1926, he permanently relocated to Cleveland. Hynek's brother Henry (Jindrich) also lived with the couple and worked for Chas Toman, Sr. as a tailor but eventually relocated to New Prague, MN and opened a shop there. Antonie was proud to be an American. She was particularly joyous when women were allowed to vote in 1920. She spoke with an accent and wrote well in English, always with a dictionary at hand as she did not want to embarrass herself or her family. She loved Texaco Metropolitan Opera radio performance on Saturdays. She loved movies - but not Tarzan. Sometimes when the couple went to the movies, Hynek would go to the Palace to watch Tarzan while she went to the New Mandan Theater to see a "classic." Antonie loved to entertain, frequently playing whist and bridge, taking advantage of her uncommon math skills. But above all, Antonie was a devout Catholic. She was active in the Altar Society and Catholic Daughters at St. Joseph's Church. Antonie was an accomplished cook of light bread dumplings (knedlicky), soups and other Czech specialties such as kolace & houska (vanocka). She made wine from chokecherries and served it with slices of houska for visitors. During WWII, Antonie rolled bandages and knitted socks and balaclavas for servicemen through the Red Cross. Unfortunately, the war touched the family in a direct way, when their son was killed in action on Okinawa on April 2, 1945. It was a tremendous shock from which the family never truly recovered. On Mother's Day 1947, Antonie experienced physical weakness. After multiple doctor visits and exploratory surgery, she was diagnosed with cancer. She died on August 4, 1947 and is buried with her husband and son in Union Cemetery, Mandan. The Society would like to thank MHSoc lifetime member Libuse [Rybnicek] Imbrone for sharing this information on her mother with us.